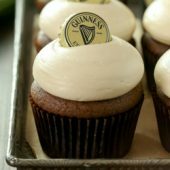 Moist homemade Guinness chocolate cupcakes, topped off with creamy Baileys brown sugar cream cheese frosting. These cupcakes are a fun and festive addition to St. Patrick's Day celebrations. 1. Preheat oven 350°F. Line cupcake tin with 10 liners. 2. In stand mixer, cream butter and sugars until light and fluffy.Mix in one egg at a time, followed by vanilla, salt and baking soda. With mixer turned off, add in cocoa powder. Mix on low until fully combined. Scrape bowl as needed. Add half of the flour. Mix on low. Add Guinness, mixing until just combined. Add in remaining flour, followed by sour cream. mix until fully combined and no streaks remain. 3. Divide batter equally between prepared liners using a large cookie scoop. Liners should be roughly 2/3 full. 4. Bake at 350°F for 15-18 minutes or until a toothpick inserted comes out clean. Cool in pan for several minutes or until easy to handle. Transfer to a wire rack to cool completely. 5. When cupcakes have cooled completely, prepare frosting. In a large bowl or stand mixer, beat together cream cheese and butter until light and fluffy. Add vanilla and brown sugar, mixing until fully combined. Add in half of the powdered sugar. Mix on low and gradually increase speed as needed. Reduce speed to low, slowly drizzle in half of Baileys (2 tablespoons). When Baileys is fully incorporated, mix in remaining powdered sugar and Baileys. Mix until fully combined and desired consistency is reached. Transfer frosting to a piping bag fit with a piping tip. Frost and decorate as desired. 6. Enjoy immediately. If making ahead, cupcakes can be stored at room temperature or chilled in the refrigerator for up to several days. Chilling cupcakes will cause the frosting to firm up. Bring to room temperature prior to eating if you prefer a softer frosting.